Another great sign! 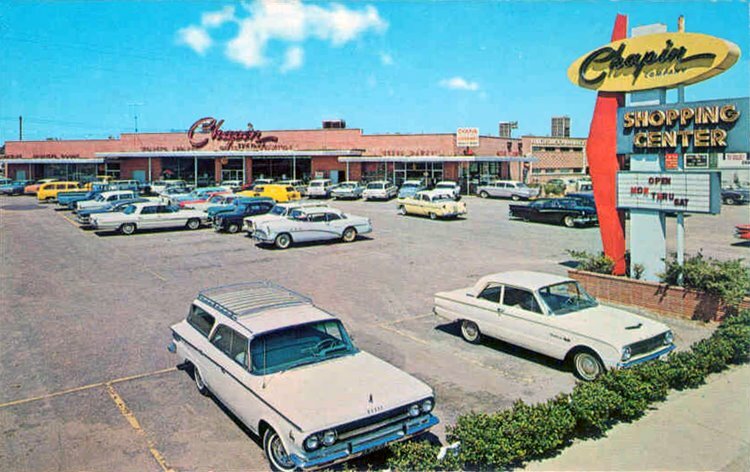 This is a 1960s view of the Chapin Company Shopping Center, in Myrtle Beach, South Carolina. This was a small shopping plaza (not an enclosed mall, I don't believe) that was based around a Chapin store, which you see situated front and center in this photo. I guess this place is now pretty obscure (aka forgotten? ), as I could find nothing about it online to share here--not even on the Chapin Company website, where they list a stable of shopping malls and plazas under their management and development (all in the Myrtle Beach area), but have nothing regarding this specific one (unless the name's been changed and it is there). I really don't even know if it's still standing today. So while this little center's history shall remain a mystery (yes, that rhymes and I'm cool) for the time being, it really doesn't matter, because I still dig this great shot and wanted to see how it would look up on the wall here anyway. Another great sign. I also like the Chapin logo, though I'm not familiar with the store. Was it a grocery chain? I love this sign!!!!!!! I would mount this sign on my front lawn if I could! FYI, the Chapin Company "Shopping Center" was actually nothing more than their own department store in downtown Myrtle Beach, although it did extend into several adjacent buildings. The store is closed, but the buildings, some of which are much older than the photo would suggest, are laregly still there. Actually, the Chapin Company went out many years ago. The building is still there, but the company went out a long time ago. To my knowledge, it's been there awhile. The parent company, Burroughs and Chapin, owns just about everything in Myrtle Beach. As a kid, we'd vacation in Myrtle Beach and actually shopped there. My father loved exploring stores and I guess I got it from him! Anyway, it was only a department store but "Chapin" was the name to know. The "parent company" as mentioned develops most of the big retail in the Grand Strand area now, like Broadway at the Beach and Coastal Grand Mall. Chapin's Department store opened in 1928, and took up the length of an entire city block. It was divided into many different sections, one of which was a grocery store. They were well known in the community for extending credit when times were tight. I once lived right across their parking lot, just to the left of this picture view. The store closed in the early 90s, and was bought in 1999-- the Highway 17 end was turned into a huge miniature golf course, part inside and part outside. The part of the building along Main Street still looks much the same as it always did. I lived in the MB area from 1969 when I was assigned to MBAFB, until 1993. I shopped at Chapin's, and had an account there. I worked for the SC Employment Security Commission, in an old building to the left of Chapin's, and later was the Area Director for MB in a new office near city hall. There was a grocery dept., and clothing dept., a gift shop, a furniture dept.and a hardware dept. in the building. I know, at one time, a man who worked in the grocery dept. for many years, used to deliver groceries to beach houses for owners who were coming to spend time at the beach. He had keys to their houses, and they would call Chapin's, place their orders, and he would have the food in their beach houses when they arrived. He also told me once, that after Labor Day back then, the streets would be empty until Spring. He also still delivered to elderly residents, who had been customers for decades, and had limited movement. He did this well into the 90's. Both the SCESC offices in which I worked have been torn down now. You have to go almost to Conway to find the new office. I still have a tent I bought at Chapins, my ex and I stayed at a campground looking for work to relocate to MB. Chapin's was owned by Mr Bellamy in the 1960's. He had 2 sons, Skeets bellamy and Bill Bellamy. He may have been the manager but I always thought he owned it. Great memories of Myrtle Beach when it was small and homey. Miss those days. HOPE FLORENCE WILL SPARE HER.